Both the process of making them, and the way they function seems safe enough. They cycled really nice in that Saiga 12 at the end of the video too! I might give this one a try. Anyone have any experience with these, that can attest to their effectiveness? I think i love this guy lol. And lol pronouncing Saiga like Sega. I would love to see what these do on ballistics gel in slow motion. Yeah, this guy is the best! I find this an intriguing and amazingly practical idea. I wonder if Y-Man is familiar with these? I wanna see if I can make bullets using substances other than lead which have higher melting points, such as iron oxide. 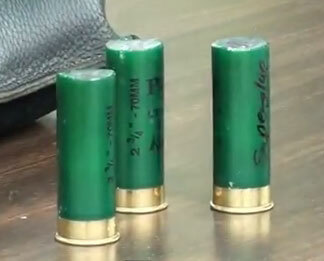 Homemade Lead Free bullets. I want to see what this does in ballistics gel. I imagine it would be pretty devastating as the shot would in theory splatter out upon impact. you obviously dont understand the point of this. I’m afraid I don’t see why one would make these except for the obvious novelty making cool homemade wax slugs. Is there a reason one would prefer these wax slugs over regular 1oz lead retail slugs? these wax slugs are a carry over from the past, like the cut shell. it was one way to make cheap and effective ‘slugs’ when the only ammo you can afford/find is bird shot. Keep in mind a box of slugs from cabelas is still federal truball rifled slugs are ~$5 per 5 where you can get 25 shots of the kent ultimate fast lead shells(still 12Gauge 2 3/4″ shells) for ~$12. So for a bit more then twice the price you get 5 times the shells. If money was very tight, like from the great depression, or if this is your only option. it is one way to get it done. Another real advantage is not all gauges have slugs available locally, like 28 gauge or 16 gauge. You can find ’em online, but I’ve never seen these in the wild. DON”T DO IT! The wax builds up in the barrel after a few shots and the gun will burst! I know. It happened to me about 40 years ago. It was used as a last resort long ago during hard times and only one or two shots were fired then the gun was cleaned with gasoline as I found out too late from my grandfather. I’m very lucky I wasn’t injured, my gun was totally destroyed. sure it wasn’t the gasoline in the barrel? plus you also have to consider that back in the day the shot didnt sit in the fancy plastic shot cup wads like it does now. the wax doesn’t build up in the gun because it isn’t touching the barrel at all, it is contained by the shot cup. plus if there was a small amount of wax left behind it would be vaporized and ejected from the barrel by the heat and pressure of the gun discharging anyway. Do you think this would work with “white school glue” instead of hot wax.Seems like it would work fine and be easier and less messy. Now that Obama is hell bent to disarm America, anyone wondering why wax slugs may make a comeback? I can still by birdshot, but slugs and 000 buck… nowhere in quantity. I can go make myself a case of these in an afternoon and go hog hunting… yes, with my shotgun that holds more than 3 rounds and is (gasp) a semi-automatic. I’ve been making them with hot glue.I dont cut the crimp all the way off,so i can glue it back down.This keeps it the same size,leaves no exposed lead at the end,and also make a kinda hollow point. The balistics are unreal,even better than slugs! The shot fuses with the cup and wads out to the size of a quarter! This is my new shotgun ammo. I’ve been firing these out of my stevens 320, wax slugs that is. Somewhere near a hundred or so rounds and while they aren’t consistant I have hit targets at the 80 to 90 yard range, with total devistation. .25 cents a round and all the fun of target shooting. So far televisions, laptops, 2x4s, and almost a 4″ tree. Never have tried a hd wax slug, anyone? If you made these from reloading components, not having to cut them open, could you crimp fold them? 1) There are “hot melt glue guns” for wax. 2) I think this could be done as a step in regular reloading and all done in the plastic cup. This would be away from powder, so any issues of heat, hot wax, naked flames, etc wouldn’t arise. 3) A bit of tape wrapped around the slits should keep any wax drips or leakage ever getting out of the slits and fouling the barrel. However, I think you could (make that WOULD) be in very deep trouble if you ever used one of these rounds in a “defense” situation. Standard disclaimer applies; these are just my inexpert thoughts and “OPINION”, they should not be used to affect anyone’s course of action. I reload my own shotgun ammo and was thinking the same thing? Have you Hurd anything?